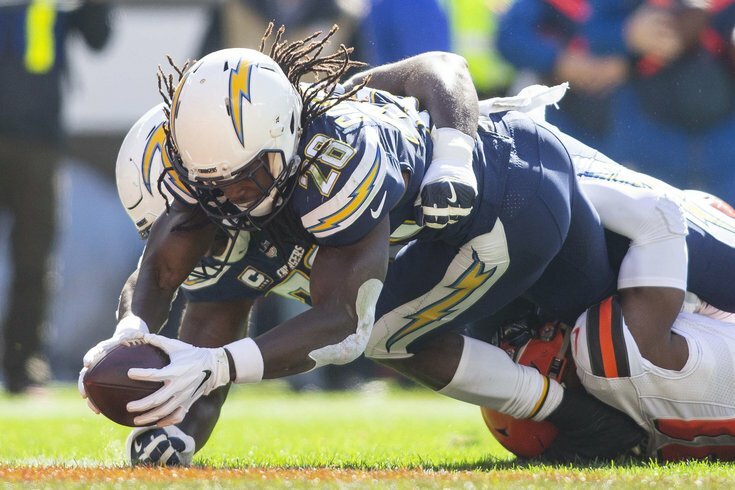 Los Angeles Chargers running back Melvin Gordon dives into the end zone for a touchdown against the Cleveland Browns. It's not a long list of fantasy-related injuries to worry about heading into Week 13, but there was a big one that will have ripple effects across every league. If you happen to own Austin Ekeler, you are in excellent shape. The news Monday morning was pretty good for the Chargers organization which feared the worst when their star running back left with an MCL injury, but couldn't be worse for his fantasy owners. According to Ian Rapoport, he's probably done for the fantasy regular season. #Chargers star RB Melvin Gordon was diagnosed with a grade 2 MCL sprain suffered in yesterday’s blowout win, sources say. He had his MRI last night. Gordon is out the next few weeks, but should be back before the end of the regular season if all goes well. He could return during fantasy playoffs, which means definitely do not drop him — just stash him in the IR. This injury, obviously, makes Austin Ekeler a valuable fantasy commodity, but likely one that is already rostered in all leagues. Justin Jackson will probably become the No. 2. Mack can't catch a break this season it seems. In and out of the line up due to injuries all season, Mack left Sunday's game with a concussion and didn't return. Which once again increases the value — potentially — of Nyheim Hines and Jordan Wilkins. Keep an eye on his progress through the NFL's concussion protocol. After missing this past week's game with a shoulder injury, Trubisky is listed as day-to-day and believes he will be good to go in Week 13 against the Giants. There is no hard evidence, aside from Trubisky's optimism to go by, so fantasy owners should have a reliable back up plan in case he can't go. The #Bengals just placed QB Andy Dalton on Injured Reserve, ending his season with this thumb injury. This news means for deep leagues or two QB leagues back up Jeff Driskel becomes a streamable option. Engram was a last minute scratch due to a hamstring injury. He hasn't been very reliable this season and is probably on waivers in your league. Another fringe fantasy tight end has injury concerns, as Heuerman left Sunday's game with a back injury. He is a day-to-day call.